MS Dhoni was named player-of-the-series after scoring 193 runs from 3 one-day internationals against Aus❘tralia. 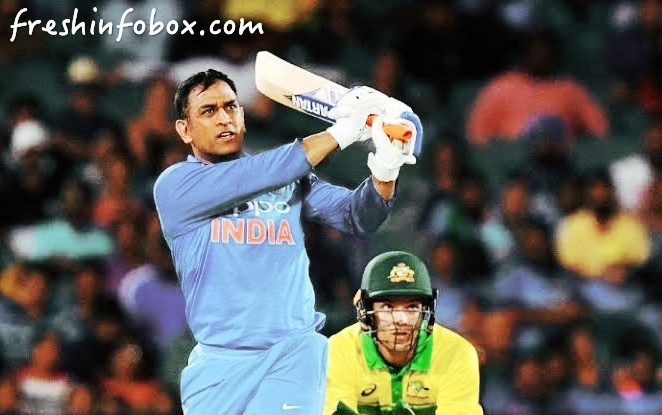 Dhoni scored 51, 55 not out and 87 not out in Sydney, Adelaide and Melbourne as India sealed their first ever bilateral ODI series in Australia. Dhoni was in poor form in 2018 when he managed only 275 runs from 20 ODIs without scoring a fifty. However, he began 2019 well enough with a half-century in the first ODI in Sydney. He was slow and struggled to accelerate as India lost by 34 runs but Dhoni showed a marked improvement during India’s chase of 299 in Adelaide on January 15. At 37 years and 195 days, Dhoni is now the oldest Indian to win a man-of-the-series award. Sunil Gavaskar held the previous record when he won the man-of-the-series award against Sri Lanka in 1987. He was 37 years and 191 days. MS Dhoni now has 7 such awards which places him joint fourth with the likes of Virat Kohli, Sourav Ganguly, Yuvraj Singh, Hashim Amla, Viv Richards and AB de Villiers. MS Dhoni is now joint second with Kohli, Ganguly and Yuvraj for most player-of-the-series awards. Sachin Tendulkar heads the all-time list with 15 awards from 1989 to 2012. Coming in to bat at No.4, Dhoni was involved in crucial partnerships with Virat Kohli and Dinesh Karthik as India chased down 299 to stay alive in the series. After Dhoni’s match-winning 55 not out at the Adelaide Oval, Sunil Gavaskar heaped praise on the 2011 World Cup-winning captain and said he now needs to be left alone and urged the critics to be a little more patient with MS Dhoni. “My prayer is to please leave the gentleman alone and he will continue to do well. He is also not getting younger. So the consistency you might have at a younger age will obviously not be there and you have to bear with that. Bear with that little inconsistency. But he’s still tremendous value to the team,” Gavaskar told India Today. Three days after that sensational half-century, Dhoni was needed again in Melbourne after India had lost Rohit Sharma and Shikhar Dhawan cheaply. Virat Kohli fell for 46 and there was still plenty to do. But Dhoni kept his calm and added an unbroken 121 for the fourth wicket with Kedar Jadhav (61 not out) to take India home. Not surprisingly, Dhoni was named man-of-the-series for his efforts.